Hats off to those who help conserve threatened species! When it comes to saving endangered species, habitat is nearly always critical. For this Greater Sage-Grouse, a bird now endangered in parts of its range, it comes down to preserving stands of healthy sagebrush. And essential to saving sage habitat is the cooperation of landowners. Recently, Rob Wesselman and his family placed 1100 acres of their land - home to Greater Sage-Grouse - into a federal conservation program called State Acres for Wildlife Enhancement, or SAFE. Hats off to the Wesselmans and others who manage their land for wildlife conservation! You can learn more at USDA.gov. When it comes to saving endangered species, habitat is nearly always critical. For the Greater Sage-Grouse, [Greater Sage-Grouse male displaying on a lek] a bird of the American West now endangered in parts of its range, it comes down to preserving stands of healthy sagebrush. And essential to saving sage habitat is the cooperation of landowners. Recently, Rob Wesselman and his family placed 1100 acres of their land in north central Washington into a federal conservation program. Their land, a mix of sage habitat and land cleared for wheat farming, is home to an endangered population of sage-grouse. [Greater Sage-Grouse sounds] The Wesselmans will manage their land for wildlife conservation for at least 15 years, through a program called State Acres for Wildlife Enhancement. While the Wesselmans will be compensated for dedicating their land to healthy habitat, they will also share the initial cost of restoring native plants. Rob sees this restoration as continuing his father’s work. For more than 50 years, to prevent soil erosion, his dad planted his land carefully. And he sees this decision as a way to ensure that all wildlife on his land, including this Vesper Sparrow we’re hearing, will thrive. BirdNote salutes the Wesselmans and all those who help conserve threatened species. Today’s show brought to you by The Lufkin Family Foundation. Sounds of the birds provided by The Macaulay Library of Natural Sounds at the Cornell Lab of Ornithology, Ithaca, New York. 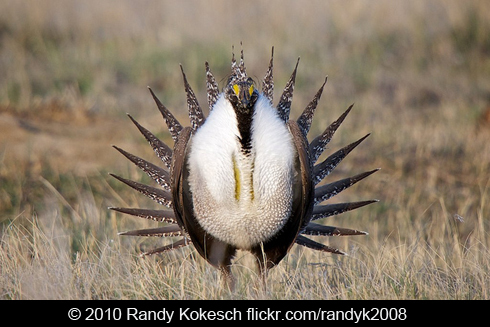 and display sounds of Greater Sage-Grouse males on a lek recorded by G.A. Keller. Ambient with Western Meadowlark recorded by C. Peterson.